NIESR's response to the Budget, and commentary on the OBR's forecasts, is here. Nick Clegg today launched the government's "Youth Contract". My earlier blog below explains why neither this nor the Labour Party's alternative is anywhere near ambitious enough, given the seriousness of the issue and the scale of the problem. "I was astonished to see you repeat David Cameron's incorrect assertion about the work experience scheme that "half [of those participating] found paid work soon after finishing the scheme" ("Can work, won't pay", March 3rd). About half of the participants stopped claiming benefits, but this does not mean that they found paid work (a substantial proportion of people do not do so). Nor should you have gone on to assert that the scheme was "apparently successful". As yet we have no data to indicate whether participants in the scheme fared better than non-participants. In my view, work experience schemes have much to commend them in principle; but those who support them should argue on the basis of facts and evidence." Unlike the Prime Minister - who was speaking on his feet in Parliament - the Economist has absolutely no excuse; a full week before they published their article, fullfact.org produced a thorough, balanced and accurate description of the available evidence. I don't know how many people the Economist has covering UK economics and politics, but surely more than fullfact by an order of magnitude. Basic fact-checking is the least we should be able to expect. Forecasts for the UK economy are grim. The Office of Budget Responsibility (OBR) predicts that, on current policies, output won't recover to its pre-crisis level until perhaps 2014 – no growth over six years. 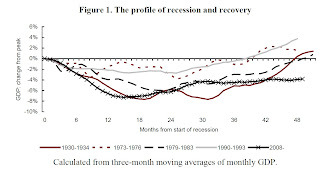 This will make this recovery far slower than that following the Great Depression, as shown in the National Institute of Economic and Social Research's famous chart here. Moreover, even in 2015,unemployment will still be well over 2 million. What do policymakers propose to do about this? Not a lot. Remember, these are the official forecasts, taking account of policy. So instead of taking any substantive action, the rhetoric is of the inevitability of a slow recovery. The governor of the Bank of England says that "the path of recovery is likely to be arduous, long and uneven." Nick Clegg, using a similar metaphor, talked about a "long, hard, road ahead". According to the FT (£) the Chancellor plans to issue an “Osborne bond” – a 100-year debt issue or even a perpetual gilt that never matures – to "to lock in the benefits of Britain’s low borrowing costs, which he claims reflect market confidence in his fiscal plans." This plan makes perfect sense from the taxpayer perspective - if the markets are prepared to lend us money for nothing (in real terms) we should be biting their hands off. As Martin Wolf has said, the markets are saying "borrow and spend, please". Borrowing more, long-term, at low interest rates, to finance the infrastructure spending the UK needs - while creating jobs and generating growth - is exactly what the economy needs right now. But this opportunity - the current level of long term interest rates - does not reflect "market confidence." Both economic theory and the empirical evidence suggest that the current level of long-term interest rates is primarily the result of economic weakness, not strength. When long-term interest rates do start to rise - as they will at some point - it will be good news; reflecting the fact that finally a sustained economic recovery is beginning to take hold. At that point, anyone who has bought an "Osborne bond" will see a large capital loss. I don't normally give investment advice; but unless you think that government policies really are condemning us to a Japan-style lost decade (or ten) - and I'm not that pessimistic - I'd give it a miss. NIESR estimates that GDP grew by 0.1% in the three months to February 2012. Output remains roughly flat. 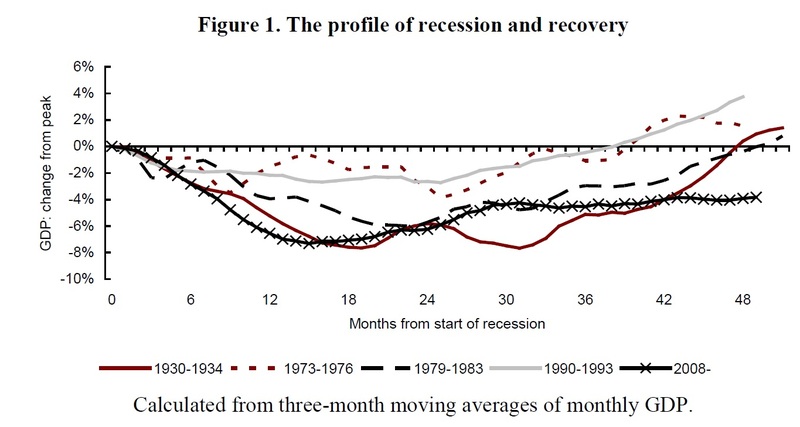 Here is a further updated version of NIESR's chart showing the path of recession and recovery in various previous downturns. The chart shows that this "depression" - defined, admittedly somewhat arbitrarily, as the time period during which output remains below its previous peak, shown as the X-axis above - is now longer than that experienced during the Great Depression, and is not likely to end any time soon. It also shows how what was initially a reasonably strong, albeit patchy, recovery stalled in the autumn of 2010; since then there has been very little growth . One of the best things about working on social policy in the UK is the depth and richness of the data, especially survey, data, that we have about British society. We may lack the comprehensive population register of, say, Sweden, but to compensate we have what I suspect is an unparalleled variety of topic-specific social surveys, from the British Crime Survey to the Workplace and Employment Relations Survey. "Young people no longer socialise with peers from other social and ethnic groups, leading to a ‘fragmented’ society"